"Tai Nan" redirects here. For the constituency in Hong Kong, see Tai Nan (constituency). Tainan (Hokkien POJ: Tâi-lâm), officially Tainan City, is a special municipality of Taiwan, facing the Formosan Strait or Taiwan Strait in the west and south. Tainan is the oldest city on the island of Taiwan and also commonly known as the "Capital City" (Chinese: 府城; pinyin: Fǔchéng; POJ: Hú-siâⁿ) for its over 200 years of history as the capital of Taiwan under Koxinga and later Qing dynasty rule. Tainan's complex history of comebacks, redefinitions and renewals inspired its popular nickname "the Phoenix City". As Taiwan's oldest urban area, Tainan was initially established by the Dutch East India Company (VOC) as a ruling and trading base called Fort Zeelandia during the period of Dutch rule on the island. After Dutch colonists were defeated by Koxinga in 1661, Tainan remained as the capital of the Tungning Kingdom until 1683 and afterwards the capital of Taiwan Prefecture under Qing Dynasty rule until 1887, when the new provincial capital was moved to Taipei. Tainan has been historically regarded as one of the oldest cities in Taiwan, and its former name, Tayouan, has been claimed to be the origin of the name "Taiwan". It is also one of Taiwan's cultural capitals, for its rich folk cultures including the famous local street food and traditional cuisine, extensively preserved Taoist rites and other living local traditions covering everything from child birth to funerals. The city houses the first Confucian school–temple in Taiwan, built in 1665, the remains of the Eastern and Southern gates of the old city, and countless other historical monuments. Tainan claims more Buddhist and Taoist temples than any other city in Taiwan. Archaeological excavations in the township of Zuozhen suggest that the Tainan region has been inhabited for at least 20,000 to 31,000 years. The indigenous Siraya tribe dominated the region by the 16th century. The Sakam people of the Sinkan sub-tribe inhabited the area of the present-day city. Other Sirayan sub-tribes, including the Soelangh, Mattauw and Baccloangh inhabited the surrounding area. By the late 16th century, Chinese merchants and fishermen had set up several bases along the west coast of the island, including a sandbar across the Taikang Inner Sea (Chinese: 臺江內海; Pe̍h-ōe-jī: Tâi-kang lāi-hái) off the bay of Sakam village (modern-day Fort Provintia). The Chinese adopted Taioan [zh] (modern-day Anping) as the name of the sandbar. Slightly north of Taioan, along the shoreline near Bassemboy (北線尾; Pak-siàn-bóe), Japanese traders established bases for trade with China. The early Chinese and Japanese also traded with the Sirayan people. Salt and food was exchanged for deer hides and dried deer meat. The Siraya people were influenced by both Chinese and Japanese cultures and lifestyles. They started to use Chinese words in their language, use Japanese tantō in ritual events, and also migrated inland due to the influx of newcomers. By the time the Europeans arrived, the influence of Chinese and Japanese traders and fishermen was already prominent. Tensions arose between the Dutch and the Chinese inhabitants of Taiwan due to heavy Dutch taxation and Dutch participation in plunder during the collapse of the Ming dynasty. Eventually, this led to the brief, but bloody, Guo Huaiyi Rebellion in 1652. The Dutch crushed the revolt only with the help of the local Sinkanese. Koxinga set about making Taiwan a base for the Ming loyalist movement. Fort Provintia was renamed Tungtu, and Fort Zeelandia became Anping. Koxinga set up military colonies on the surrounding plains to help feed his forces. Many suburbs surrounding Tainan City today include in their names "Ying", "Jia", and "Tian", all derived from this event. After the death of Koxinga in 1662, his son, Zheng Jing, changed the name of Dongdu to Dong Ning. His chief minister, Chen Yonghua [zh], introduced Chinese bureaucracy, built the first Confucius temple on the island, and introduced the method of salt production to coastal areas. The British were invited to set up a trading post in Anping to continue trade between Taiwan, Japan, and South East Asia. This helped to maintain the region as a center of trade. The death of Zheng Jing in 1681 was followed by a struggle for succession. Seizing the advantage presented by the infighting, on July 17, 1683, Qing naval commander Shi Lang defeated the Tungning fleet in the Battle of Penghu. Two days later, Qing troops landed at Tungning and encountered little resistance. In 1684 the kingdom was incorporated into the Qing Empire as part of Fujian province, ending two decades of rule by the Zheng family. Taiwan Prefecture was established, with its prefectural seat Taiwanfu at modern-day Tainan. A flood in 1823 brought rich silt from nearby rivers, which formed a widespread new fertile plain across the Taijiang bay area between Tainan and Anping. A canal system called Go-tiau-kang (五條港; Pe̍h-ōe-jī: Gō͘-tiâu-káng) was built to keep the port in Tainan functioning but prevented large ships from entering the bay. In 1885, the Qing government commenced work to develop the island into Taiwan Province. The capital of the island (and its designation as "Taiwanfu") was moved to Toatun (modern-day Taichung). The name of the old Taiwanfu was changed to Tainanfu, the seat of Tainan Prefecture. As a consequence of the Chinese losing the First Sino-Japanese War in 1895, Taiwan and the Penghu Islands were ceded to Japan by the Treaty of Shimonoseki. The Republic of Formosa was proclaimed in Tainan in May 1895, in an effort to pre-empt the Japanese occupation. A Japanese army arrived at Tainan in October 1895. Liu Yongfu and the other Republican leaders fled, leaving the city in disarray. A Scottish missionary, Thomas Barclay, was chosen by local elites and foreign merchants to negotiate the Japanese entry into the city. As a result, Tainan was taken without resistance. Under Japanese rule, Tainan was initially administered under Tainan Ken (臺南縣). 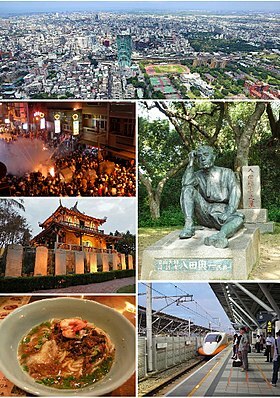 With a population of about 50,000 in 1904, Tainan was Taiwan's most populous city. The anti-Japanese uprising known as the Tapani Incident began in Ta-pa-ni (modern-day Yujing) on April 9, 1915. The revolt, led by Yu Qingfang [zh], spread quickly across the whole island and was supported by both Chinese and indigenous Taiwanese. The Japanese crushed the uprising. Many villages were destroyed and thousands of people were killed during the repression which followed. Yu Qingfang was captured on August 22, 1915. More than 800 people were sentenced to death in Tainan. Over 100 of them were executed while the rest were pardoned by the new Taishō Emperor. The place where the rebellion began, Xilai Temple in Tainan (臺南西來庵), was demolished. The event marked a turning point in Japanese policy, from forced pacification to modernisation and integration of Taiwan into the Japanese Empire. The Japanese renamed the city to Tainan Chō (臺南廳) in 1901, and then Tainan Shū (臺南州) in 1920. Tainan Prefecture included modern-day Yunlin, Chiayi, and the wider region of Tainan. Tainan served as the capital city. The Japanese transformed Tainan by building modern infrastructure, including schools, a courthouse, city hall, new telecommunication facilities, an extensive freight and passenger rail network, a new Anping canal replacing the Go-tiau-kang, an airport, and an irrigation system across the Tainan and Chiayi regions. Modern urban designs were introduced; old narrow streets and city walls were demolished and replaced with wide streets that form the cityscape of the modern-day Tainan city center. They also introduced much needed sanitary reforms. The Republic of China (ROC) took over Taiwan on 25 October 1945 after World War II. Tainan City and Tainan County were established and became separate local entities under Taiwan Province in 1946. There was civil unrest in Tainan as part of the February 28 Incident in 1947. Tang De-Jhang, a Japanese descent and Japanese educated lawyer, was a member of government which set up "The February 28 Incident Commission" and a popular candidate for city mayor, was accused of being a separatist and arrested by the ROC army on March 11. He was tortured and executed the next day in the park in front of Tainan City Hall (now named Tang Te-chang Memorial Park). Tang was posthumously pronounced not guilty by court later in March. Like other regions in Taiwan, many people in Tainan suffered for their real or perceived opposition to the Kuomintang (KMT, Chinese Nationalist Party) during the autocratic era. In 1992, a redevelopment plan in the West district, to widen Haian Rd and build an underground plaza proved a failure as lack of geological surveying and overall planning meant that the works ran into a layer of groundwater. The development destroyed part of the historic Go-tiau-kang area. As a consequence, the Zhongzheng Road district, previously the most popular shopping precinct in Tainan since Japanese rule, went into decline due to the poor quality of the environment. By the mid-1990s, there was a growing awareness of the need to protect Tainan's historical and cultural treasures. Since then, the government and civil societies have worked to protect Tainan's heritage. It is an ongoing issue for Tainan to protect its past while reviving its old business center. The lives of Tainan citizens are closely related to many Chinese gods and temples. Parents bring their children to the "Weaving Maid goddess" (Chinese: 七娘媽; Pe̍h-ōe-jī: Chhit-niû-má), the children’s goddess, to wish for good will. Traditionally Chinese people step into adulthood when they are 20. In Tainan, there is a large ritual celebration for all 16-year-olds on the seventh day of the seventh lunar month, the goddess's birthday. This extended celebration is unique to Tainan: In the past, families with children working in the harbor took the advantage of this ceremony to show the employers that their children should be paid in adult rate after this day. Many well-known Taiwanese food dishes originated in Tainan. Since Tainan was a center of sugar production, Tainan cuisine tends to be sweeter than other Taiwanese cuisines. For example, eel noodle soup has a distinctive sweet and sour taste. Milkfish dishes are very popular in Tainan, where locals also call it "Koxinga's fish" (Chinese: 國姓魚; Pe̍h-ōe-jī: kok-sèng-hî). People believe the Chinese name of the fish (虱目魚; sat-ba̍k-hî) was given by Koxinga, and this name has been loaned into Japanese as sabahī (サバヒー). The fish are bred in farms located in the coastal outskirts of the city. Many Tainan restaurants and snack stands have histories that trace back to the Qing or Japanese eras. Grand Matsu Temple (大天后宮), in honor of the sea goddess Mazu. Originally the residence of the King Ningjing of the Tungning Kingdom. Shuixian Gong (水仙宮), the Water Gods temple, built in Qing Dynasty after Go-tiau-kang was constructed. There are many other well-known temples and shrines not on this list, such as Anping District's Tianhou Temple (supposedly the oldest on Taiwan proper), the Altar of Heaven temple (天壇), and the re-built Xilai temple (西來庵) etc. They are all the centers of religion in Tainan. Tainan has a tangible sense of history and is the site of several spectacular religious festivals. As well as its string of forts, the first capital of Taiwan has some 300 ancient sanctuaries, from the island's first Confucian temple to its first Taoist temple. The Taiwan Confucian Temple (or the Scholarly Temple) was built in 1665 by Cheng Ching, son of Koxinga, to offer lectures and cultivate intellectuals. It was the first learning institute for children when Taiwan was ruled by the Qing Dynasty. As a result, it is also called the First Academy of Taiwan. The temple is a popular tourist attraction and preserves ancient Confucian ceremonies, which are conducted regularly. The grounds include storerooms for the ritual implements and musical instruments that are used in these ceremonies. The National Cheng Kung University Museum is located at the National Cheng Kung University. One of the youngest museums in Tainan. Exhibits important objects from the history of education in southern Taiwan. The museum is ICOM member since 2016. As Tainan is the one of the larger metropolitan areas in Taiwan, it has many department stores, shopping malls abeend prestigious boutiques. Several of the best-known luxury brands have branches or counters in Tainan. Flower Night Market is a good place to enjoy the Taiwanese lifestyle. It is one of the most famous night markets and it is often considered to be the largest night market of Taiwan; however, unlike the others, this night market is open for business three days a week - Thursday, Saturday, and Sunday. In Yanshui District, the most important and prominent fireworks in Lantern Festival are the so-called "beehives", essentially multiple launchers of bottle rockets. These rocket forts are actually thousands of bottle rockets arranged row atop row in an iron-and-wooden framework. The set-up looks like a beehive full of unleashed gunpowder. When the contraption is ignited, rockets shoot out rapidly in all directions. Dazzling explosives whiz and whirl across the sky and often into the crowd itself, both thrilling and intimidating the spectators. Tainan has a humid subtropical climate, closely bordering a tropical wet-dry sub-climate. The city is characterized by year-round high relative humidity and temperatures (although temperatures do dip somewhat in the winter months), with a rainy season (April to September) and a dry season (October to March). The earliest plan of the city was designed by Dutch colonist, Cornelis Jansz. Plockhoy, the designer of this new settlement, laid a 25-30m wide main street (on today’s Minquan Rd Sec. 2) across the settlement and radial roads than ran deep into agricultural developments . The Han Chinese settlement “Heliaogang Jie” (today’s Zhongyi Rd) later crossed the main street of Provintia and formed the so-called Shizi Dajie (十字大街) or The Great Cross Street. With the fall of the Ming dynasty, new migrants flooded into the settlement. Chinese population boomed from 5,000 to 35,000 between 1640 and 1661. As a result, farmers, deer hunters, traders and craftsmen each formed a colony on the cross street. The cityscape of modern Tainan was founded under the urban redevelopment programs carried out by Japanese colonial government. The city center adopted a Baroque design similar to the Paris renovation in mid 19th century, the plan connected major facilities via a system of wide streets and five square-roundabouts. Among the five squares, Taishō Park (大正公園, modern-day Tang Te-chang Memorial Park) at the center is the most important crossing point. The square is surrounded by the city hall, the fire brigade and the weather bureau. It is connected by a number of avenues heading towards the train station, the airport, military bases and the dock at the end of the Anping cannel. With the police station and the court nearby, this area demonstrated the power of the colonial government within the city. The financial district was located in Shirokanechō (白金町) and Ōmiyachō (大宮町) between Taishō park and Anping cannel along Ginzadōri (銀座通り), the modern day Zhongzheng Rd. It was the busiest street of the city from Japanese rule to the mid-1990s. Many Colonial Baroque style historic buildings from Japanese era can be found in this part of the city. Beyond the city center, Tainan city can be divided into two: the River South Region and the River North Region, bounded by the Zengwen River. Currently there are two administration centers, one in Anping District and another in Xinying District. They are former Provincial Tainan city government and Tainan county government respectively. Administration centers manages citywide affairs and developments such as education and city planning. Apart from administration centers, there are district offices functioning as local access point to the governmental services. Huang Wei-cher, the incumbent Mayor of Tainan. In 2001, Hsu Tain-Tsair of the Democratic Progressive Party was elected with 43% of the vote. His closest rival was Kuomintang legislator Chen Rong-sheng, who garnered 37%. In 2005. Mayor Hsu was re-elected, polling 46% to Chen Rong-sheng's 41%. In 2010, William Lai of the DPP was elected mayor. However, after Lai's appointment as Premier of the Republic of China in September 2017, the mayor position was filled by Li Meng-yen as acting mayor. Once reliant on traditional manufacturing industries, the region became a major high-tech industrial hub after the establishment of Southern Taiwan Science Park in 1995. Optoelectronics, integrated circuits, green energy and biotechnology are the park's dominant industries. Prominent companies are Chimei-Innolux, United Microelectronics and TSMC. With the establishment of Tainan Technology Park, Shugu (Tree Valley) LCD Park and Yonkang Technology Park, the city became a major center for the optoelectronics industry in Taiwan with a complete supply chain. Tainan still plays an important role in auto parts, food processing, textiles, plastics and other traditional manufacturing. Notable companies include Uni-President, Chi Mei and Tainan Spinning, which have headquarters in the city. Overall, industrial production accounted for 62.6% of the gross city product in 2010. Agriculture is important to the city, especially the River North Region. While fisheries and fish farming signify the coastal districts, rice and fruit farms shaped the landscape of the inland agriculture region. The city is famous for its milkfish, oyster, rice, mango, sugar cane, pomelo (文旦), pineapple and lotus seed. A state-funded agricultural research center was established in Xinhua District to ensure the market competitiveness of the crop. The headquarters of the World Vegetable Center, an NPO that aims to improve crop quality in poorer countries, is in Shanhua District. Once dominant industries, salt and sugar production are declining to almost non-existence. Taiyen (Taiwan salt) co. and Taiwan Sugar Corp., both headquartered in Tainan, transformed to businesses in biotechnology, quality agriculture, retail and tourism. Orchid growing is one of the most symbolic agriculture industry for its well-known brand name in the floristry world. A nationally founded special plantation district with R&D resources is established in Houbi District. Tourism is an industry with increasing importance. As the first capital of Taiwan, the wealth resource of cultural heritage and its potential is under exploration. In the first half of 2013, there were over 7 million tourist visited attractions in the city. There are high-end hotels in the city, including the Shangri-la Hotel near Tainan train station. Retail and services is the largest employment sector in Tainan, margined at 52% in 2010. The city center hosts five department stores including two Shin Kong-Mitsukoshi, two FE21s and Focus square. Apart from the city center, there are shopping precincts around the city, with the strongest presence in East, North and Yongkang districts. 'Dream Mall' is a joint development project between Uni-President Corp. and Tainan Spinning Ltd. It was the largest shopping center in the city when it opened Feb 12, 2015 and the precinct will host the new headquarters of Tainan Spinning and a new five-star hotel. The precinct is in the designated East Tainan second CBD near the border of the East and Yongkang districts. Original plan for Tainan MRT system is muted due to the construction cost and the question of insufficient ridership. Upgrading current railway and buses are now considered as alternative citywide modern public transport options. Tainan has three major bus operators. They are Singing Bus Co., Shinan Buses and Kaohsiung Buses, operating in river north region, intercity routes and metropolitan routes respectively. In 2012, the city government called to restructure Singing Bus and Shinan Buses route to form a Tainan City Bus System. This new system, which set to start operation in 2013, has six main routes connecting the city and eight main interchanges. From the main routes 66 branch routes then spread out to service local communities. City government hope this new system will boost the public transports ridership and progress into metro-bus system in the future. A project to transform the railway in the city center into an underground is underway as part of the National wide TRA Rapid Transit Systematization in the Metropolitan Areas Project. This project will help increase service frequency by eliminate potential disruption between road and rail traffic. Further to underground transformation, two new stations are planned to serve East district commuters. Together with the Shalun HSR link, this section of TRA corridor will become the backbone of the rail transit system in Tainan. Tainan Airport (TNN) is located in the South District is close center city only six kilometers. As a regional airport, it currently operate both domestic and international flights to Hong Kong, Ho Chi Minh City, Kinmen, Magong and Osaka. Previously there were also services to Taipei's Songshan Airport (TSA), but these were dropped in light of falling revenues (generally agreed to be a result of the High Speed Rail commencing operation in 2007). National Cheng Kung University (國立成功大學), is famous for its engineering programs. Founded in the Japanese era in 1931 as Tainan Technical College, it has a total area of 183,000 square metres. As the number of colleges expanded, it was upgraded to a provincial university in 1956, then national university in 1971. Today, National Cheng Kung University serves nearly 21,000 students through 9 colleges, 39 departments, and 49 graduate institutes. Tainan National University of the Arts (國立臺南藝術大學) TNNUA exists to prepare talented individuals for careers in visual and performing arts, sound and image design, building arts, conservation arts, and art history and critique. The university emphasizes learning through individual attention and independent work creation. It is a public institution, established in 1996. Chang Jung Christian University is a private university affiliated with the Presbyterian Church in Taiwan. CJU offers masters and doctoral degree programs and aims to promote fraternity, justice and service for Taiwan. It is located south of the city, in Gueiren. Shone An (安钧璨) (1983–2015), singer, actor and television host. Szuyu Rachel Su (蘇思羽) (born 1998), pianist. ^ 臺南市政府全球資訊網. Tainan.gov.tw. Archived from the original on January 18, 2013. Retrieved 2013-01-23. ^ "台南市統計月報" (PDF) (in Chinese). Retrieved 13 June 2016. ^ Chang, Winnie (April 1994). "Rise of the Phoenix?". Taiwan Today. Retrieved 2012-01-10. ^ "Tainan Confucian Temple". Council for Cultural Affairs. Archived from the original on 2008-05-01. Retrieved 2008-08-19. ^ a b c d e f g h i j 蔡玉仙; et al., eds. (2007). 府城文史 (in Chinese). Tainan City Government. ISBN 9789860094343. ^ a b c d e f g Shih Shou-chien, ed. (2003). 福爾摩沙 : 十七世紀的臺灣、荷蘭與東亞 [Ilha Formosa: the Emergence of Taiwan on the World Scene in the 17th Century] (in Chinese). National Palace Museum. ISBN 9789575624415. ^ a b c d Kato, Mitsutaka (2007) . 昨日府城 明星台南: 發現日治下的老臺南 (in Chinese). Translated by 黃秉珩. 臺南市文化資產保護協會. ISBN 9789572807996. ^ a b c d e f Rubinstein, Murry A., ed. (2007). Taiwan: A New History (expanded ed.). New York: M.E. Sharpe. ISBN 9780765614940. ^ "Anping Harbor National Historical Park". Tainan City Government. Archived from the original on 2009-10-15. Retrieved 2010-03-31. ^ Also Taiwan-fu, Taiwan Fu, Taiwan Foo, &c.
^ "Anping Harbor National Historical Park". Tainan City Government. Archived from the original on 2010-03-14. Retrieved 2010-03-25. ^ Campbell, William (1915). Sketches from Formosa. London: Marshall Brothers. pp. 16–17. OL 7051071M. ^ Also Tainan-fu, Tainan Fu, Tainan Foo, &c.
^ Chamberlain, B.; Mason, W.B. (1903). A Handbook for Travellers in Japan (7th ed.). London: J. Murray. p. 553. OL 25302448M. ^ "湯德章". Archived from the original on January 21, 2010. Retrieved 2010-04-17. ^ 張銘清訪台遇襲事件 (in Chinese). Retrieved 2010-04-18. ^ Kuo-fang, Huang; Hsu, Elizabeth (13 February 2016). "Remains of last unaccounted-for quake victim found". Focus Taiwan. The Central News Agency. Retrieved 18 February 2016. ^ a b c d e "台南市文資導讀". Tainan City Government. Retrieved 2011-05-12. ^ "Sword Lion". Anping Harbor National Historical Park. Archived from the original on 2006-02-23. Retrieved 2011-05-12. ^ "Tainan Traditional Orchestra". Tainan Traditional Orchestra. Archived from the original on 6 September 2006. Retrieved 6 November 2011. ^ "Chimei Orchestra (Chinese)". Chimei Museum. Archived from the original on November 1, 2011. Retrieved 6 November 2011. ^ "Chang Jung University Orchestra". Chang Jung University. Archived from the original on December 27, 2013. Retrieved 6 November 2011. ^ "Ten Drum Official Website (Chinese)". Ten Drum Art Percussion Group. Ten Drum Art Percussion Group. Retrieved 6 November 2011. ^ "Gold Coast travel guide: Tainan". Retrieved 24 November 2018. ^ 中央氣象局 (in Chinese). Cwb.gov.tw. 2011-01-31. Retrieved 2014-01-22. ^ a b c d 金山, 翁 (2002). 台南市都市設計規劃綱要之研究 1 都市空間的溯源與演化. 財團法人成大建築文教基金會. ^ "Green and blue belts reference" (PDF). Archived from the original (PDF) on April 25, 2012. Retrieved 2011-11-02. ^ "CEPD". Archived from the original on 2012-04-07. Retrieved 2011-11-02. ^ "LCD manufacturing in Tainan". Tainan City Government. Archived from the original on May 20, 2009. Retrieved 20 November 2011. ^ a b "Report on the economic structure to CPED". Tainan City Government. Archived from the original on 7 April 2012. Retrieved 20 November 2011. ^ "Tainan District Agricultural Research & Extension Station, COA". COA. Archived from the original on March 6, 2014. Retrieved 18 May 2013. ^ "AVRDC". Retrieved 18 May 2013. ^ "Taiwan Orchid Plantation". Taiwan Orchid Plantation. Archived from the original on 2011-10-21. Retrieved 20 November 2011. ^ 臺南市觀光遊憩景點遊客人次統計 (PDF). Tainan City Government Tourism Bureau Official Website. Tainan City Government Tourism Bureau. Archived from the original (PDF) on 2016-01-28. Retrieved 14 September 2013. ^ "Transfer Information". Taiwan High Speed Rail. Archived from the original on 2012-11-25. Retrieved 2012-12-06. ^ "MRT Plans" (in Chinese). Bureau of High Speed Rail. Retrieved 2008-08-20. ^ "Tainan City Bus System". Archived from the original on 2 March 2013. Retrieved 24 March 2013. ^ a b "Tainan Public Transport Plan". Tainan City Government. Tainan City Government. Retrieved 23 March 2013. ^ "The Tainan Urban District Railway Underground Project". Retrieved 24 March 2013. ^ "2005 statistics" (PDF). Tainan City Government. Archived from the original (PDF) on September 10, 2008. Retrieved 2008-08-19. ^ "Tainan Airport Departure Flight Status (Monthly)". TAINAN AIRPORT. Retrieved 2017-12-25. ^ Lin, Judy (1 Mar 2008). "FAT to sell investments to cover costs". Taipei Times. p. 12. Retrieved 2008-08-20. ^ "Brief History". National Cheng Kung University. Archived from the original on 2008-09-13. Retrieved 2008-08-20. ^ "Organization". National Cheng Kung University. Archived from the original on 2008-08-18. Retrieved 2008-08-20. ^ "Introduction". Tainan Theological College and Seminary. Archived from the original on May 22, 2007. Retrieved 2008-08-20. ^ "Inventor of the Week: Momofuku Ando". MIT. Archived from the original on August 3, 2008. Retrieved 2008-08-19. ^ "Parking near the Municipal Stadium" (in Chinese). Uni-President Lions. Archived from the original on 2008-09-13. Retrieved 2008-08-20. ^ "Ra'anana: Twin towns & Sister cities - Friends around the World". raanana.muni.il. Archived from the original on February 28, 2010. Retrieved 24 March 2010.